This easy-to-read book covers the key points you need to know about the Ten Terrains. 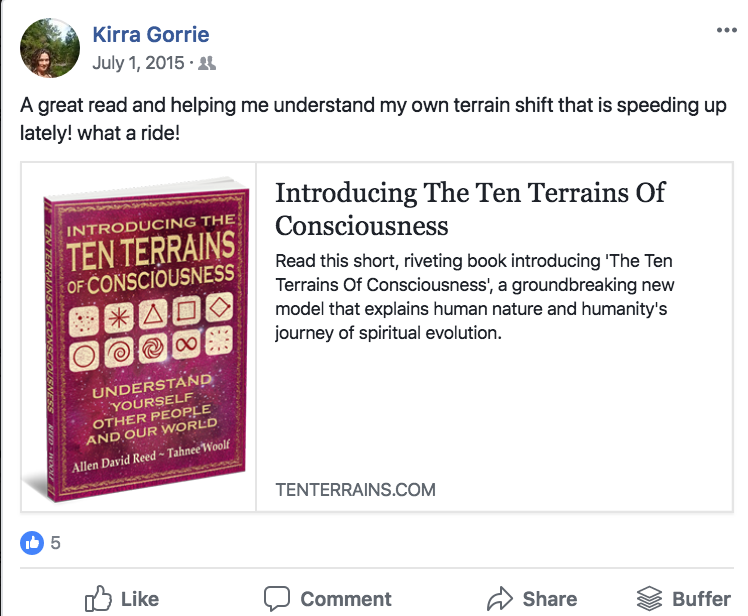 All about Terrains﻿ Of Consc﻿iousness: what they are and how they operate, both within individuals and at the collective level. Each of the ten Terrains individually, explaining the core features of each Terrain with enough examples so that you will have a good sense of it. By the end of this book, you will be able to start to recognize the different Terrains as they play out in the world around you. You will be able to spot them in the public sphere, among your friends and family, and in your own life. You will be able to understand where YOU are at in your own evolutionary spiritual journey and where we are at as a collective culture. 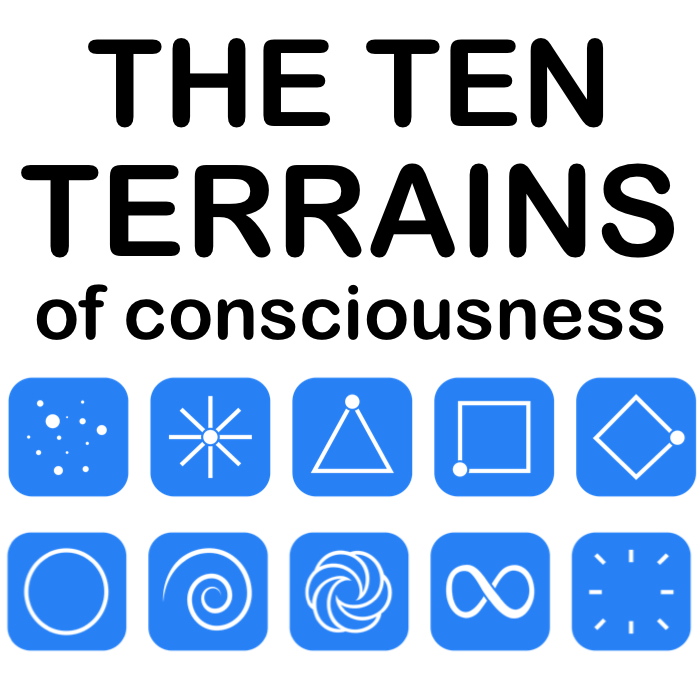 You will be familiar enough with the Ten Terrains Model that you will be able to discuss it with people and take part in the growing Terrains conversation around the world. Get the book now from your favorite bookshop! Because this is a Print-On-Demand book, some vendors (like Amazon) may list it as 'Temporarily out of stock'. ​Just go ahead and order, it will only take a day! 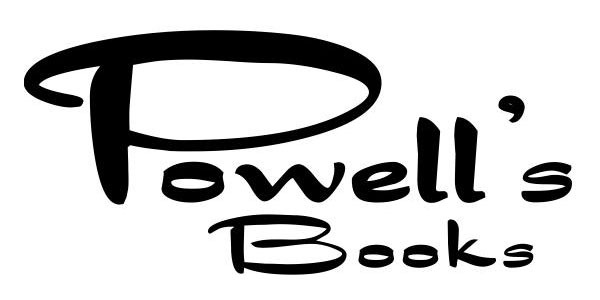 If you enjoy the book, please leave a review to inspire other people to read it too! ⭐️⭐️⭐️⭐️⭐️ Book of the Decade! "This ground breaking book is the most powerful book I have read in over a decade! If I could give it 6 stars I would - 5 stars is simply not enough! We are living in fast-paced world and these changing times challenge our thinking at every bend and turn.. Why do we think the way we do? Why is the world changing so fast today? Why do we get along with certain people and not with others? If you have ever pondered the answers to these questions then pick up this book and prepare yourself for lot of huge "light bulb moment" revelations! Every single person on this planet views the world according to how highly developed their level of consciousness is. Discovering your terrain of consciousness is like a breath of fresh air and finding where you "fit" into the world puts everything into perspective. 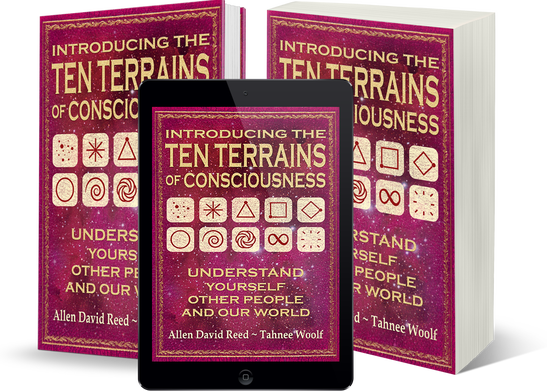 You will also discover what terrain humanity's consciousness is currently at as well as which terrains your friends and family members are the most likely to be at. . Reading The Ten Terrains is like being handed a set of keys to all the doors of Universal wisdom and knowledge you just can't wait to unlock and explore!" ⭐️⭐️⭐️⭐️⭐️A great read: thought-provoking, helpful and applicable to everyday life. Recommended. "These two authors should have a PhD in human consciousness and connection! The overall concept, and the authors' ability to clearly articulate quite complex ‘data’, deserves not only serious consideration, but to be analysed, studied and taught, as their analysis and understanding will help others. The book contains easy-to-understand visual analogies: mountains, valleys, trains, Luke Skywalker, Russian dolls; it makes it easy for the reader to follow the examples. It is written in easy-to-understand English, and distills complex thought into a ‘story’ – it’s hard to put down once you’ve started reading! The authors make the proposition that the universe is “healing us all back to Unity”. Regardless of your view, this book is a massively positive, and much needed, wake-up call which enables people to understand themselves, those around them and society – and make conscious choices regarding how they view the world and interact with it." "A must read! What a fantastic, easy to read, deeply enlightening and clarifying experience this book is. I could not put it down! 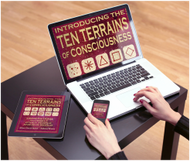 The Ten Terrains is presented with heart and clarity making it exceptionally easy to digest. It's definitely not just another model, perspective or profiling system. Anyone reading this book will get a great deal out of it. I applaud Tahnee Woolf and Allen David Reed for creating this work and bringing it into the world. Personally I gained deep and immediate insight into further understanding the world, the collective human consciousness, my family relationships and dynamics and myself. This has supported me to have deeper compassion, understanding, self acceptance and peace. I highly recommend this book! Enjoy!" ⭐️⭐️⭐️⭐️⭐️ Your deep truth unveiled! "Loved this book. I’ve had a spiritual teacher for about 15 years who has guided and mentored me. This book gave me clarity re subtle yet profound changes over this time I had experienced. I have a richer understanding of the people around me at home and work and generally in life. It is as if the filters have been lifted and a deep truth revealed. It has made it so much easier to understand others. A great resource highly recommended." 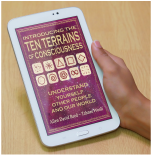 'Introducing The 10 Terrains of Consciousness' is not only an interesting read but also a fascinating resource for the game of life. Witnessing any lively dinner party discussion soon shows the 10 Terrains of Consciousness at work and play in our lives! As I read through the book I discovered unexpected benefits in exploring each of the Terrains while searching for the Terrain I felt I was at. I recognised the Terrains of consciousness of my three very different adult children, I had ahahh moments regarding my relationships with close friends and found a new level of peace with a previous marriage. Possibly the most frustrating aspect in relationships is the conflict from the expectation we can have of each other to see and understand reality according to our own paradigm. The wisdom shared in '10 Terrains of Consciousness' reveals how unrealistic and limiting this stance is for ourselves, for others and our planetary journey. I feel that knowing even a generalisation of each Terrain can usher in less judgement and more compassion, especially combined with the opportunity for self-knowledge. ​With the gift of hindsight I was able to signpost some of my more remarkable Terrain shifts (sometimes landslides!!) that opened up new ways of thinking and living. I decided I have come a long way and while reading the book I felt encouraged to applaud my own journey of change and growth." I loved it. It is written in a way that is so easy to understand. It is full of incredible insight into how we, as humans, perceive not only our relationships with each other and the world but also our connection (or perceived separation) with the complete Universe, through whatever terrain of consciousness we may be at. It is so beautifully non-judgmental and non-hierarchical and helps one to fully embrace our equality with each other, no matter which Terrain one may be at. Thank you Tahnee and Allen for this amazing experience. Much love to you both. "This book came to my life when I was stuck whether to leave my relationship or stay. It really helped me to see another perspective and opened my eyes to see my own life unfolding in this amazing book. Wether or not my relationship will endure, it absolutely helps me to accept where we both are and feel more peaceful as a result. So wisdom has replaced my emotional pain. I understand more how this world/my being is evolving. If you are looking for solutions and new attitudes/perspectives this book will most likely blow your mind." "Not even finished this amazing book yet I've realised how far life has taken me & feel this book will be one to watch as a bestseller in near future! I'll certainly be telling my friends about it & also feel it could be used within the education system as a fantastic 'tool' for exploration amongst students & teachers alike! Well deserved 5!" ⭐️⭐️⭐️⭐️⭐️ ​This gem of a book is highly recommended! "I finished reading the book in almost one sitting! I was so engrossed and am so happy I came across your work. It helped explain a lot of my experiences and answered many questions! I don’t think I’ve come across any book that explains so clearly the way your book did the different dimensions and the differences in our experiences and perspectives as we journey through 3D and into other higher dimensions. I mean, much has been written about 3D, 4D and 5D but nothing comes close to the very clear and concise explanation that you made in the book, thank you! I was so fascinated particularly with the section on Spiral. Like it was describing my very experiences! What I also appreciate about the book is the balanced presentation of esoteric and scientific material. Most of the materials I’ve come across are too woo-woo. Admittedly, I was initially a bit apprehensive that it may be another model that would lead to more labelling and highlight even more the divisiveness and separateness amongst us. Thankfully, the model, in fact, helps us gain a better understanding and appreciation not only of ourselves but where everyone else is coming from --- individually and collectively. Equipped with this increased knowledge and awareness, we can then have more respect and compassion for everyone else and why they think or behave the way they do. I'm so thankful that I came across this gem of a book. I highly recommend it and can't wait for the next one! Blessed be." "This body of work is a true a gift to humanity. There are many who won't be ready to receive it, but that's OK too. Truly extraordinary." ​"An amazing book. This book ignites a deeper understanding of our sense of self and others, inviting us to live with more compassion, wisdom and heart. Highly recommend." "Do you know why luxury items are expensive? Because they are made by hand with expensive elements, parts, ingredients. Luxury items take time, consciousness and expertise. They are finely crafted. This book should be 100x more expensive based on the amount of time, effort, consciousness, and expertise they put into this work. 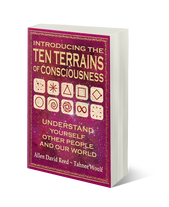 Ten Terrains combines a tremendous amount of research of ancient wisdom packaged and innovated into a very modern understanding with tons of examples for wise application. Ten Terrains is great for seeing people for where they are. It helps to disengage from argument and upsets that happen from being at very different terrains. I appreciate how Allen and Tahnee give lots of examples to help clarify and understand each Terrain. Examples help us relate and practice." Then go to Amazon and buy the book. When you complete your purchase, select your Kindle Reader App from the "Deliver to" drop-down box... then Amazon will send the book right to your App. Open your Kindle App & start reading!